States without Nations: Can the Commander in Chief Use Military Funds to (Falsely?) Imprison Alleged Noncitizens and Asylum-Seekers? Can the Commander in Chief Use Military Funds to (Falsely?) Imprison Alleged Noncitizens and Asylum-Seekers? I just listened to Trump's plan for holding noncitizens in what sound like military bases while they wait for their immigration court dates. He claimed that lack of space is the only reason people now are being released prior to their scheduled court dates and seemed to relish the likelihood that the harsh conditions of confinement will discourage people from exercising their rights to claim asylum (or prove lawful residence or U.S. citizenship). The idea seems to be that the government can avoid the expenses of prolonged detention by throwing people into military camps. Here is an article from June discussing the options considered. The legal authority to do this seems unclear. The photo of one facility was released on October 30. 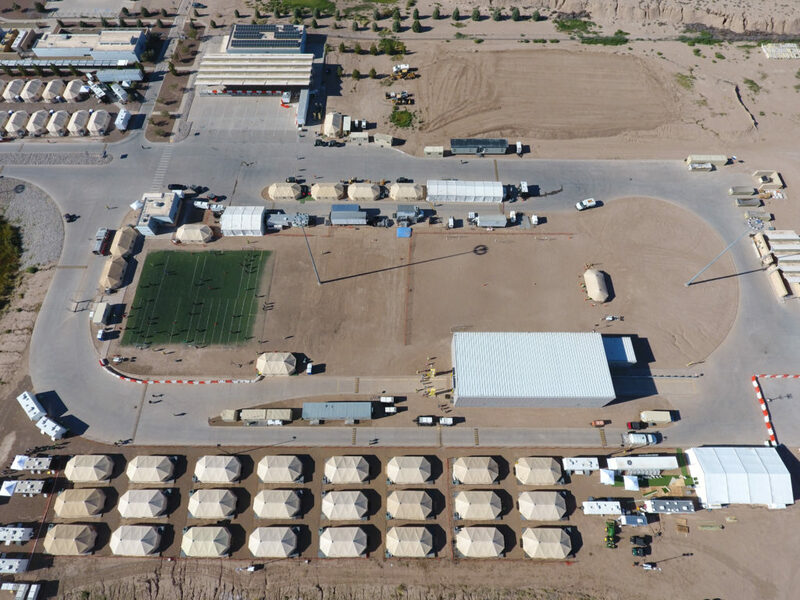 2018 by the Department of Heath and Human Services, but the facility was actually being paid for by the Army. It appears that Air Force and Army also may be queuing up some bids and proposals. If you're a journalist interested in poking around, go to https://www.fbo.gov and look for contracts with the NAICS Code 236220 -- Commercial and Institutional Building Construction. There are a few that seem plausible. One that especially caught my attention is one that was posted on October 10 with an October 30 deadline for firms expressing an interest. This office intends to solicit offers for SABER (Simplified Acquisition of Base Engineer Requirements) execution of multi trade real property maintenance and repair of military facilities at Joint Base San Antonio, Texas. Delivery Orders will be issued under the general contract to include a broad range of work in a variety of trades, including but not limited to site work, roadway construction and repair, drainage, utilities, electrical (interior and exterior distribution), construction of building facilities, renovation of existing building facilities, structural repairs, roofing, plumbing, HVAC, controls painting, asbestos and lead based paint abatement, demolition, and installation or removal of large equipment such as boilers, chillers, etc. Estimated contract ceiling amount is $50M. Up to 8 contracts will be awarded. Duration of each contract will be 5 years. Here's another one, at Lackland AFB. Not only is this an unusual turnaround time for bids but the archiving time frame also is quite short and the project public description seem inconsistent with the budget and other details. Does the Air Force or Army have authority to use its appropriations to build structures for locking up noncitizens seeking a review of their asylum or other applications for admission? What about people who are U.S. citizens or have other legal status and are put into custody under immigration laws nonetheless? Are the authorizations for these speedy bids proper and in the Appropriations Act? Is Trump calling the folks in the caravan an "invasion" part of his effort to invoke his authority as Commander of Chief to avoid legal challenges to unauthorized expenditures?